Benetti today is what all the others would like to be - the leader. Over the last six years no company in the world has managed to best them in the number of superyachts produced, meaning vessels over 24 metres LOA. 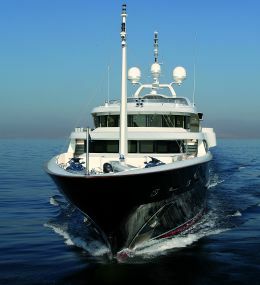 Maltese Cross A1 E Yachting Service AMS/MCA. 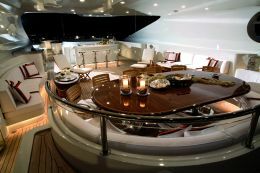 For further information: Azimut-Benetti; via Michele Coppino, 104; 55049 Viareggio (LC), Italy; tel. 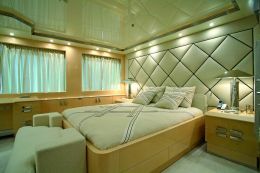 +39 05843821-396232; web site www.benetti.it; e-mail info@benettiyachts.it. This positioning is undoubtedly due to the extraordinary success of the Benetti line in composite of which three are currently being built: Tradition, Classic and Vision, of 30, 37 and 43 metres respectively. A fourth, smaller model is being added, 24 metres and also displacement, the Legend. But in terms of turnover the line of steel hull vessels also contributes substantially. Sunday, construction FB 235, the ship you see illustrated here, belongs to the latter line, 58 metres long and developed on five decks. Launched in Leghorn at the most recently built Benetti production premises - the others are in Fano and, the historic one, in Viareggio - Sunday was built by developing the same 56 metre hull design of two other Benetti ships launched just a year earlier: Galaxi and Allegro. Lengthening of a couple of metres, equally subdivided amidships and at the bow, gives increased volume to exploit internally but also lends more thrust to the aesthetics of the yacht which, with her five decks, already has considerable vertical development. 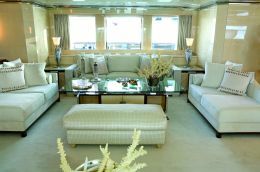 The designer is Stefano Natucci, a Benetti regular who has done the exteriors of almost all their ships produced between 2003 and today. 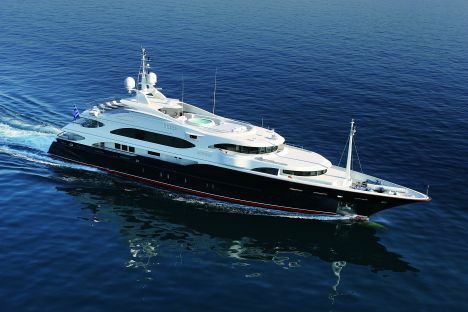 But he also designed one of the concept yachts, "Wave", 85 metres, recently presented by Fincantieri Yacht, Benetti's partner in the 70 metre plus market. The steel hulled Sunday was built - both structures and on-board plant and apparatus - using the most modern construction technologies. For example the aluminium sheets of the superstructure were cut with numerical control laser equipment, decidedly more precise than the other established systems such as plasma cutting. This not only meant a more rapid production process, drastically reducing metalwork and bodywork, but also greater overall quality due to tolerances reduced to "hairsbreadth", which evidently simplified subsequent assembly and welding of the various parts. As mentioned above, the hull follows the lines of the 56 metre design and is displacement, stabilised by a Vosper active fin system. Powered by two 1.850 HP Caterpillar engines, the top speed is 16 knots with a cruising speed of 15. The waterlines are designed for great hydrodynamic efficiency, and thanks to considerable fuel tank capacity Sunday has an ocean-going range of 5000 miles. Interior design and furnishings were handled by Sofoclis Emmanuelidis' IPSO studio. He declared that he had drawn inspiration from the Normandie, a 1930's ship commissioned by the Compagnie Générale Transatlantique, one of the finest and richest liners crossing the Atlantic in the period between the two world wars. 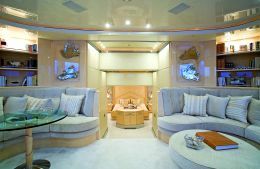 Just like aboard that transatlantic liner, as you gradually visit Sunday's various spaces and decks you perceive a very intense sense of luxury and exclusiveness, which in the case of this Benetti evidently fully interprets the tastes and lifestyle of the owner and his wife. 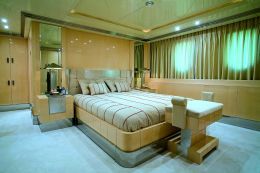 The latter played an active and determining role in designing the interiors of this yacht which is intended for family use but also has MCA certification. Sunday's five decks are a succession of refinements, things made to measure, precious materials, rare objects, paintings and sculptures, pieces that would delight a collector or a gallery. 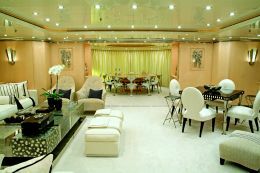 Details designed and presented in such a way as to embellish every room, every space of this ship, so she is highly interesting and full of artistic inspirations, clearly exuding the creative personality of the owner's wife. 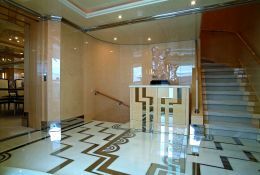 As a linking thread there are decorations with maple root polished to mirror finish, frames and plinths in polished steel, and ceilings composed of gloss white lacquered panels, also mirror finished, which reflect the white carpets. 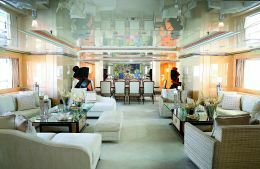 Aboard you move from gold leaf inlay, on the furniture doors in the 12-seat dining room, to Botero's pastels and Sofia Vari's sculptures in the bright and spacious saloon. From the map of the Mediterranean, painted on a wall of the owner's study and showing the main cities and monuments (created by ALM Décor, the studio of Paris artist Mireille Herbst) to the steel inlays in the white onyx floor of the foyer. 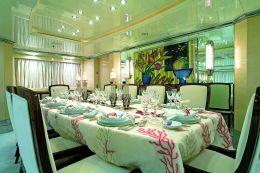 From Schmidts' iron sculptures that embellish the four guest cabins - two with double and two with twin beds - to the hand decorated metal panels depicting the four seasons in the owner's cabin situated forward on the main deck. The circular veranda, an outdoor dining area aft on the upper deck, is also worth mentioning. Designer Marc Brasier Jones created seats in the form of dolphins that surround an enormous table whose centrepiece is an actual compass. Above there is a dome, again faced in gold leaf, with optic fibres that reproduce the zodiac signs of each member of the family. 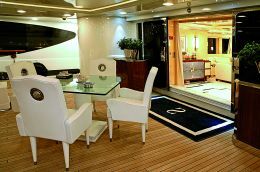 On the same deck, forward of the VIP and skipper's cabins and adjacent to the radio room, the wheelhouse is finished in beige leather panels with stripe motifs in black leather. The floor of this area is in hide with steel inserts while the black leather console is equipped with full hi-tech instrumentation. Externally on both sides there are well defined wings, linked forward of the main deck by stairways. Here, where the technical area for mooring is situated, there are also two jet-skis and a service boat, handled by a special davit. The stern garage, which is equipped with a storehouse, can also house two tenders (7.50 and 5.30 metres) and another two jet-skis. Lastly, a word about the sundeck: vast and teak-floored it's the place for lovers of suntan and relaxation, with pool, sun-beds, bar, dining table and sofas.